I started to get highlights in January after finally coming to terms with the fact that I’m starting to go grey, and while I was IN LOVE with them for the first 6 months or so, I slowly started to notice changes with my hair. It’s drier than it used to be, the ends are split and damaged, and even though it looks fabulous every time I leave the salon, it has completely lost it’s bounce and shine. But what REALLY gets me is the fact that my hair has become so weak and unhealthy that the headband I’ve been wearing to the gym for the last THREE YEARS recently made the entire front section of my hair break off. Of course, when I brought these issues up to my stylist, he insisted it wasn’t the highlights, and kept lecturing me about washing my hair too frequently and styling it with too many hot tools, and when I reminded him that I have not changed my styling routine in over 20 years, he brushed me off as though I didn’t know what I was talking about. And when I asked him what we should do about the small section of severely damaged (and short) hair that has formed on one side of my head (side swept bangs? straight across bangs? ), he suggested we just leave them ‘as is’. I cried every single day after my last visit to the salon, but now that my hair has grown out a little, I’ve had time to play around with different hairstyles, and I’ve educated myself on the different kinds of hair dyes and the potential damages of each, I’m ready to look for a new hairstylist so I can do something about these horrid highlights (did I mention they are also streaky??!) and find a way to make my hair look less damaged and unhealthy. Which brings me to the point of this post: I’m thinking of getting side bangs. Now, I know what you’re thinking. You want to warn me that getting bangs is a HUGE commitment, and that I shouldn’t jump in until I really weigh all of the pros and cons, but I assure you that ANYTHING will be an improvement upon the grotesquely damaged half-bangs I’ve been sporting for the last 2 months. And after staying up ridiculously late watching tutorials on how to get perfect side swept bangs yesterday, I’m pretty excited. This is by far one of the best bang tutorials I’ve ever watched. I have NEVER been able to figure out how to get side swept bangs to lay against my forehead and slightly cover one eye, but this clip taught me the secret and I absolutely love the look. In fact, I included this tutorial in a post I did about styling regular bangs a few months ago, and I almost went out and cut side swept bangs that afternoon. I’m so bummed I didn’t as I probably wouldn’t be in this mess if I’d followed through! If you like side bangs, but can’t standing having them directly in your face, this look by Mimi from Luxy Hair is a great option. It adds a bit of volume and personality, and I think it’s the perfect compliment to beach waves! If you’re trying to grow out your side bangs, or you just prefer to keep them longer so you can pin them away from your face, this is a great collection of ideas to keep them looking stylish. I especially like the tip of having one layer of shorter bangs and one layer of longer bangs as I feel that would give you so many fabulous styling options! 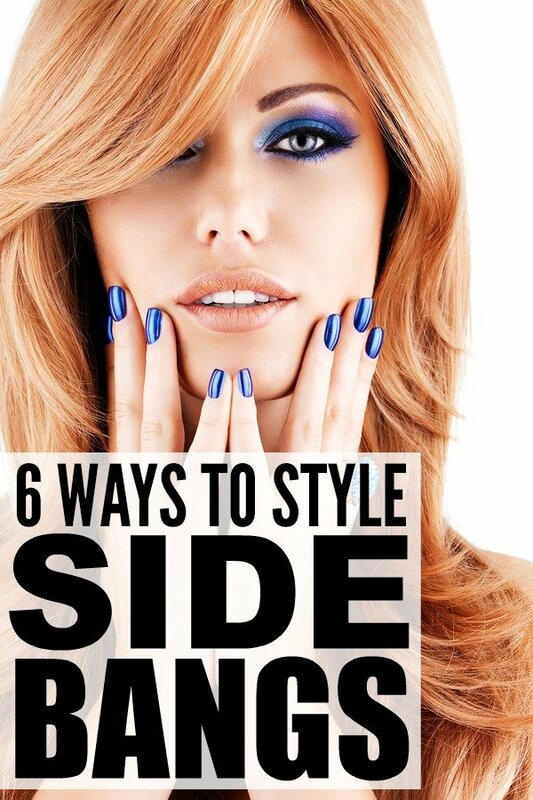 If you liked these side bang styling ideas, please share them on Pinterest! And if you’re looking for more fabulous hairstyles, please follow our Hair board where we share all kinds of inspiration!